Just love it.I prepared this last friday. 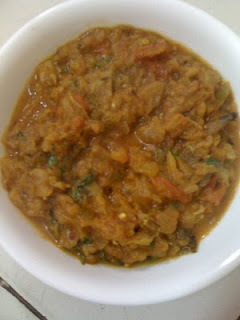 Soo tempting baingan barta, just love it. I love this dish! Even I tried it from Manjula's Kitchen.. I love to try this one,but no one here likes brinjal :( So i am lazy to try for only me,too bad that I am so lazy,every time when I see this somewhere I curse myself ;) Very nice recipe! cool blog. eggplant looks pretty tempting. Sounds like a great dish! Good job! I have never tried using garlic in this dish. I will post my version this week. I call it 'enna kathrikka'! Nice blog :) This looks super tasty! Looks yummy vidhya!!!! i have never attempted this @ home!!! Must give it a try now!!!! I just had a question about your website, iyercooks.com , and found it fun and interesting! If you could e-mail me back, I would love to talk with you.